Arsenal Wares - i.e. the Flea vendor formerly known as Savage Queen Creations - was started in January 2017 by Blakey Hunter, an artist, actor, and filmmaker (just to name a few of his trades. Hunter's inspiration comes from his mother who passed away in 2016 and was his adventure partner, creative equal, and best friend. 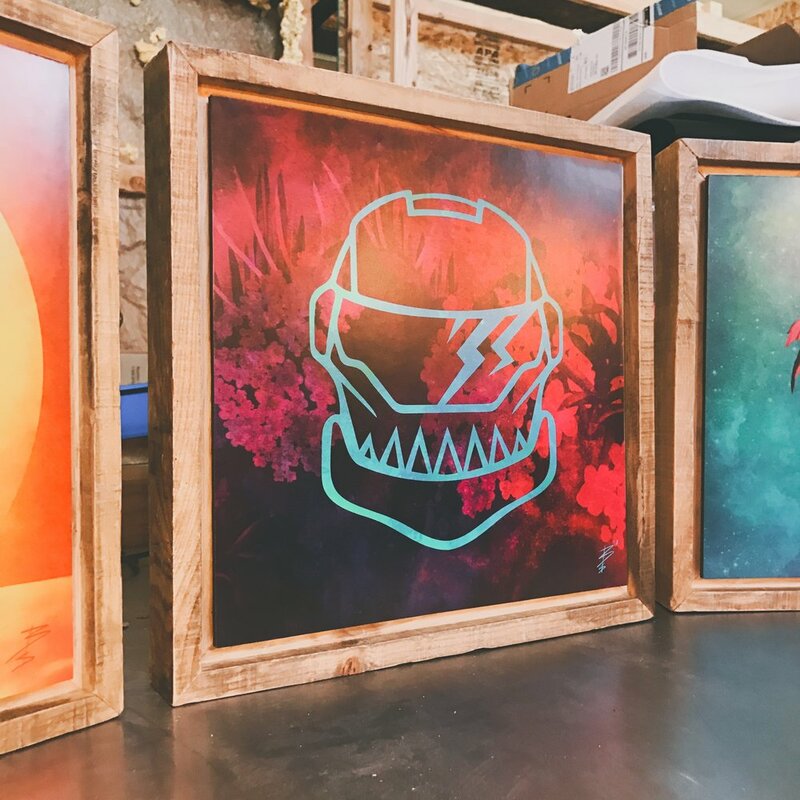 All made in Colorado, Arsenal Wares' fine art prints and goods are influenced by emotion, film, music and empowerment, and all profits go to Hunter's film production costs. Arsenal means freedom to me. Freedom to inspire and empower us to make something beautiful with our lives despite despite the flaws. The name “Arsenal” is a metaphor for the tools we need to get the day done, to “Conquer the World.” Personally, I’ve struggled with severe Anxiety and OCD episodes since losing my Mom. Because of this all of the Products and Artwork I made were to help me thrive in my environment. Environmental Wellness is at the center of my Brand. how has your PROCESS evolved over the years? When engaged and challenged, I become a fast learner. Since opening I discovered a fascination for business. It is an Art in itself that I love exploring. Goal number one is always to streamline my process. Time is the ultimate currency that they aren’t making more of. I think of my process of building and creating like a Mario Kart track. Each lap I look for tricks and secrets to discover paving a easier way to victory. I love the thrill of finding new ways to create things at a lower cost but higher quality allowing me to reach more people with my Art and Wares. All of this allowed me to start reaching out to local companies that could make some things better and faster then I ever could which in turn allowed my to explore new avenues such as the recent purchase of a Laser Machine to help create designs I never thought I could make myself. how was your brand evolved? what is your favorite product or collection you've created? My Favorite product is my first invention. It’s a Magnetic Frame I invented called the ‘Metaframe’ and ‘Metamount’ It was inspired from my own struggles with OCD and Anxiety and from seeing facebook posts of my artwork still in it’s packaging on display by customers. I realized I hadn’t hung a single piece of my own artwork because of the fear of getting tired of seeing it as my mood changed. Regardless, I curiously went to the framing department of my local craft store to see how much it costed customers to frame my work. After an hour of debate and a comical argument over the color of matte they said would “enhance the artists vision” I finally proclaimed that in fact I am the artist and that I don’t think a tacky matte color is in my vision. Even with the simplified frame the quote was well over $100. Nope. As I was driving home I saw a pallet of wood on the side of the road. From building my sets I learned a thing or two about wood working so grabbed it and in an hour made 3 frames with velcro on the front to swap my prints whenever I wanted without making more holes in the wall or paying a ton to reframe new work. Now a few prototypes later they are made with strong rare earth magnets and reclaimed barn wood. My Mom was the inspiration. Janice Lynne Shattuck was may creative partner in crime and together I felt like we were unstoppable. We were known for always going for the gold in anything we did even with little to no experience. After she passed away on August 9, 2016 I was left with a world that was barely recognizable. Only a month later my Dad who’s never been sick a day in his life was diagnosed with cancer. My family quickly unraveled as the world continued to turn. Life transformed into a constant battlefield triggering every flaw in my being but despite this I knew I had to prove one thing. That you can beat me up and kick me when I’m down but you’ll never kill the gift my Mom shared with me, our creativity. Her dream was to walk a red carpet since she was a little girl. Deep down I felt like I wasn’t fast enough at finishing the movie to give her that but I knew I could still show the world what this amazing woman inspired me to do and they would come to know her and eventually come to love her. This brand has become part of my Mom’s ever growing legacy. Now that my Dad is better I hope to share in it’s healing effects with my entire family. It helps me feel close to my Mom like she is continuing to live on and make a difference in other’s lives. The fact that it’s funding the sci-fi film we were working on together makes it feel like she never left. We'd love to put the La Palma print up on our living room wall, so we can think of beaches and palm trees on snow days ! I’m currently finishing up my first children’s book in time for the holidays called ‘The Feels Guide: Stories of the Daft Heart’ based on my ‘Daft Heart’ Series of Artwork. My passion is storytelling through film so I only started painting and designing less than a year ago.